GCDC is offering a candlelit dinner with three courses for $35 per person. If you’re looking to celebrate Valentine’s Day on a budget while sticking close to home, Foggy Bottom restaurants have you covered. For a casual Italian meal just minutes from your residence hall, head to Bertucci’s in The Shops at 2000 Penn. The Foggy Bottom restaurant is offering three Valentine’s Day deals this year. For $35, you can get a dinner for you and your significant other that has soup or salad, two entrees like fettuccine alfredo or margherita pizza and a dessert to share, where diners can choose from options like rich chocolate cake or tiramisu. If you’re looking to complement your meal with wine, you can opt for Bertucci’s second deal which consists of two entrees paired with a wine for $60. Entrees range from grilled chicken marsala in a wine sauce with broccoli and roasted potatoes to grilled shrimp risotto formaggi with aged Italian cheese and wine reduction. While Tonic might be the place you drag yourself to for brunch after a night out, but this Valentine’s Day you can switch out tots for a three-course meal. This Foggy Bottom establishment is offering a three-course dinner for two for just $40 this Valentine’s Day. The meal includes a salad or soup, a choice of entree – grilled rib-eye served with garlic mashed potatoes and sauteed green beans, mushroom ravioli with tomato cream sauce or grilled Barramundi fish served with zucchini and oven-dried tomatoes – and two cupcakes. Tonic is also offering select bottles of red and white wines for $25. With Tonic’s outside heated tent seating option, which is garnished with decorative lights, the restaurant makes for a good date option without leaving campus. 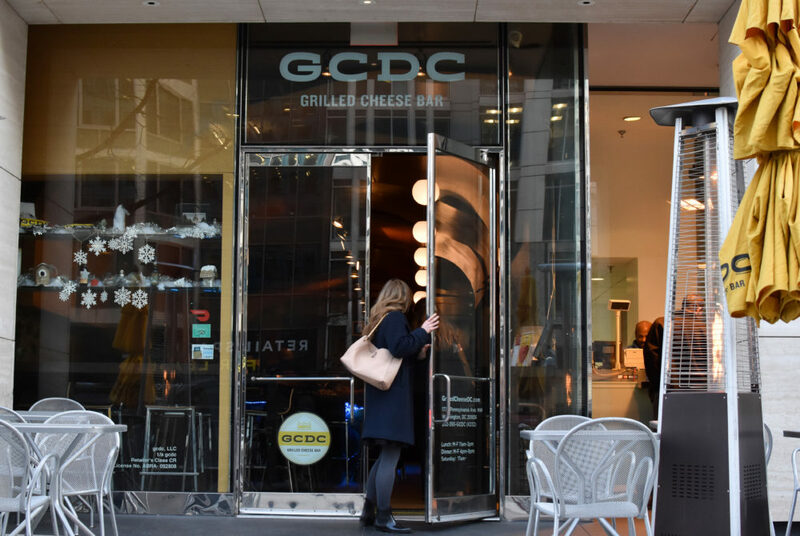 For a Valentine’s date that is the good kind of cheesy, GCDC is the place to go. The restaurant’s Valentine’s Day deal offers a candlelit dinner with three courses for $35 per person. Start your meal with an appetizer of your choice like lobster mac and cheese, a parmesan bleu cheese salad or loaded tater tots with cheddar sauce, bacon, jalapenos and pico de gallo. Then indulge in one of GCDC’s out-of-the-box grilled cheese sandwiches like lobster, chicken parmesan or smoked gouda and apple. Finally, for dessert, indulge yourself in a flourless chocolate cake with fresh berries and Chantilly cream. If you’re in the mood for some bubbly, the restaurant will also offer $25 bottles of champagne. GCDC will have two seatings on Valentine’s Day at 5 p.m. and 7 p.m.
With a dimly lit interior and wood-paneled walls, Kaz Sushi Bistro is one of the most romantic GWorld options. Kaz Sushi Bistro is offering its guests two deals for the holiday. The first Valentine’s Day deal is the omakase menu, which plates five courses for $67 per person. To start off, you can choose cherrystone clam miso soup, grilled avocado with shrimp or a winter vegetable salad. The next two courses range from spicy scallop ceviche and yuzu salmon with chili ponzu to shrimp lotus root tempura and hanger steak with garlic miso sauce. The main event is the omakase itself, which is the chef’s choice of six pieces of sushi and one roll, before finishing on a sweet note with green tea cheesecake and tapioca chocolate cake. If five courses isn’t enough, the sushi spot’s second deal tacks on a sixth course of tuna and beet poke or yellowtail tartare for $80 per person.